I am a research fellow in the Astrophysics & Space Physics area working on solar physics. 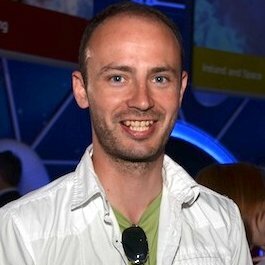 I originally studied experimental physics at University College Dublin with a heavy emphasis on mathematics and computer science. I received my PhD from Trinity College Dublin studying Coronal Mass Ejections using the twin vantage points of NASA's STEREO Spacecraft. After obtaining my PhD I decided to take a break from academia and took on a role as a software engineer at Skytek. While at Skytek I learned about modern software development practices working on various projects in the aerospace and security sectors. Ultimately I decided to return to a more research research role. I currently work on solar flares, using X-ray and gamma-ray imaging observations to understand the process that govern these massive releases of energy. I am part of the STIX team, STIX is one of the 10 instruments making up ESA Solar Orbiter mission due for launch in 2019. Solar Orbiter will fly inside the orbit of Mercury and leave the ecliptic producing some novel observations and furthering our understanding of the Sun, our nearest Star, and its effect on us. STIX (Spectrometer / Telescope for Imaging X-Rays) STIX will take X-ray observations of the sun from 4-150 keV at a maximum rate of 0.1 s. As part of the STIX team I am involved in number of aspects the project. Developing the ground software to process quick look and house keeping data as well as process and store science data in an archive. Developing the analysis software other researchers will use once STIX is operational. During the cruise phase STIX will return data for calibration and testing purposes which will need to analysed and updates sent to to the instrument. Finally once operational I will be analysing the science data for new insights into flare physics. XRAYVISION (X-ray VISIbilty Imaging) X-ray telescopes such as RHESSI and STIX are Fourier type telescopes, meaning they do not take images in the tradition sense. The record photon counts which can be transformed into specific Fourier components. Akin to the way radio interferometry or synthesis imaging works. In general the transformation of these Fourier components in to images requires advanced algorithms. XRAYVISION is a python package which attempts to bring python implementations of collection of these algorithms to the solar physics community.